Sidewalk artists participate in a past “Chalk It Up!” chalk art contest in downtown Delaware. The 2017 edition is scheduled from 6 to 8 p.m. Friday. • Creative Strings Delaware Music Hop, Delaware County District Library, all branches, 2 to 4 p.m. Friday. For the 15th year, the Creative Strings Festival will feature 14 guest artists who will collaborate with more than 65 string players. They will perform at the Delaware Main, Powell, Ostrander and Orange branches. For a full schedule of venues they will be playing at go to www.christianhowes.com/education/creative-strings-workshop/creative-strings-festival-schedule-of-performances/. • Celebration of the Sun, Perkins Observatory, 61 S. Sandusky St., Delaware, 4 to 6 p.m. Saturday. The observatory will feature solar observations and information about an upcoming solar eclipse. The event will reoccur on July 15 and 22. Call 740-363-1257 for reservations. • Ice Age Encounters, Shale Hollow Park, 6320 Artesian Run, Lewis Center, 2 p.m. Sunday. The park district will provide information about animals and the landscape of Ohio that existed more than 10,000 years ago on a hike through the park. Free for all ages. No reservations required. Spiderman: Homecoming (PG-13): 1 p.m., 4 p.m., 7 p.m.
Transformers: The Last Knight (PG-13): 1:15 p.m., 4:15 p.m., 7:15 p.m.
Despicable Me 3 (PG): 1:30 p.m., 4:30 p.m., 7:30 p.m.
Spiderman: Homecoming (PG-13): 2 p.m., 5 p.m., 8 p.m.
Transformers: The Last Knight (PG-13): 2:15 p.m., 5:15 p.m., 8:15 p.m.
Despicable Me 3 (PG): 2:30 p.m., 5:30 p.m., 8:30 p.m.
Main Street Delaware will use the July First Friday to gift wrap the news about its repackaging of holiday activities in December. The nonprofit organization will kick off its “Home for the Holidays” weekend with the annual Christmas tree lighting on Dec. 1, followed by the Holiday Open House to encourage local shopping in downtown on Dec. 2 with the annual Christmas parade to cap it off on Dec. 3. In addition, Santa Clause will make appearances at the Strand Theatre, 28 E. Winter St., Fridays and Saturdays in December. Holiday Open House usually occurs in mid-December, while the Christmas parade has taken place for decades on the Sunday before Thanksgiving, said Main Street Delaware Executive Director Susie Bibler. “We want to make people aware of that change,” she said. The organization’s Christmas committee has met once a month since January to determine the enhancements. 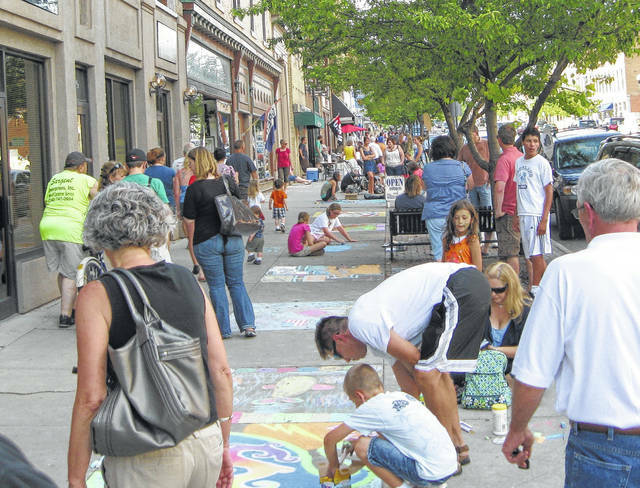 The sidewalk chalk art contest will take place from 6 to 8 p.m. Artists can work at any time on Friday, but must be finished by 8 p.m. to allow time for photographs of their work to be taken. The photos will be added to an album on the Main Street’s Facebook page, where the public can vote for their favorites. “People’s Choice” will be awarded in youth and adult categories. One winner will be chosen for the best “Christmas in July” creation. In addition, artists can dedicate their work to their favorite Main Street business. The business recognized with the most art will earn a prize. Competitors must bring their own chalk and secure a concrete canvas on Sandusky Street between Spring Street and Central Avenue or on William and Winter streets between Franklin and Union streets. The entry fee is $10 per square. Registration forms are available online at www.mainstreetdelaware.com and at downtown businesses. Main Street Delaware volunteers will collect registration forms for voting on the night of the event. Area businesses will provide sidewalk chalk at no cost for young artists who are not participating in the contest. Families are invited to stay downtown to learn more about December’s “Home for the Holidays” and to watch a late-night screening of the Christmas comedy “Home Alone” at the historic Strand Theatre, 20 E. Winter St., sponsored by RE/MAX Allegiance. Holiday-themed trivia will start at 9:30 p.m. with the film to start at 10 p.m. Tickets are $5 per person, with children age 6 and younger admitted free. Each ticket includes a box of Strand popcorn. Bibler said they will raise awareness again about its new holiday tradition in October with another Christmas-related film at the Strand. “It’s going to be ‘Die Hard,’ which is a non-Christmas Christmas movie,” Bibler said.